Last time not worn: Technically 2006, when it was retired for Bruce Sutter. So actually 1996 when MLB retired the number across the sport. Could there be anyone else for this spot? Well before the days of social media and even TLR scowling in the dugout, every generation of St. Louis baseball has a moment. We will get to the Freese and Pujols adventures later in the countdown (just watched the Blu-Ray of 2011 Game 6 a couple nights ago in fact! ), but the Cardinals have one specific memory that kept fans going through the dark days of the 1990’s. Most remember Whitey Herzog for his mastery from the dugout but in my humble opinion, it was his work as the General Manager that made the epic 1982 season possible. Wearing both hats for part of 1980 and all of 1981, Herzog was able to not only build the team he wanted but play against those he needed to acquire. Sutter was busy winning awards in Chicago and leading the league in saves when Whitey all but stole him to start the renovations in St. Louis. He again set the bar in saves that first campaign wearing #42 for the Birds on the Bat but also placed in the top 10 for both the Cy Young and MVP. Just in case you were wondering, that was 1981 and all he did the following season was improve to top five for both awards. Sure, he again had the most saves in the National League and may have the single most important last pitch in franchise history. The Cardinals do not win the 1982 World Series without Sutter, and the Hall of Fame is the icing on the cake. After a down year, Sutter authored his best individual performance and garnered another top 3 Cy Young finish. That propelled Sutter to become a very rich closer in Atlanta although he was never the same after leaving St. Louis. And even though I tend to not spend much time dwelling on it, would Sutter on the 1985 squad change that outcome? I guess we will never know but spoiler alert coming — that ’85 team is going to be awfully busy around here soon! 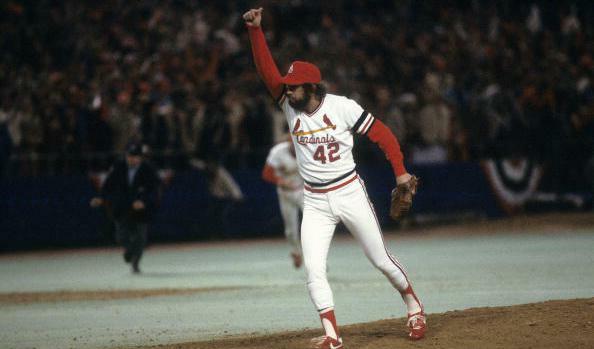 I came away even more impressed with Sutter than I was before, but one could argue he didn’t have the single greatest pitching season for the Cardinals wearing 42. That honor could very well belong to Haddix, who in 1953 put up video game numbers. As a 27-year old rookie, the southpaw finished 19 of his 33 starts and threw six shutouts along the way. Probably the strangest part, however, was how Haddix ended up getting to 20 wins. He held the Cubs scoreless on September 21st for victory #19 but must have had one of those easy outings so to speak. That is because Haddix came back the next day and secured the save before throwing another complete game on the 25th that makes my arm tired thinking about it. Stay tuned as @C70 and I continue lowering our Spring Magic Number and let us know how you are liking the countdown!